The Comfort Quilts winter schedule and location begins on Wednesday October 5th. Check the calendar on the website for our full schedule. If you are not able to join us on Wednesdays but would like to make a quilt for Comfort Quilts you can pick up precut kits from Kathleen Keane or Nancy Picco at the Guild meeting. 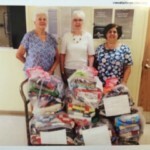 Dee Rizzo, Barbara Powers and Julie Long delivering 48 quilts to the Behavorial Center.